Recently, my close friend was telling me about a beautiful farm wedding she attended last summer where they served Southern sweet tea in mason jars. It was so quaint, so romantic, and so creative. It then got me thinking – what else could those jars be used for aside from home canning recipes for your fruits and veggies? The answer is: plenty. And this is great, considering the jars, which can be found at most grocery stores and even thrift shops, are super easy on the wallet. Here are my top tips for using canning jars throughout your home. Because they’re available in every size, from quarter-pint to gallon, canning jars offer a simple way to customize pantry storage on a budget. Just head to your local hardware store to purchase them a case at a time in whatever size you need. For dry spice blends, the super small sizes might be best. For flour, sugar, coffee, or loose tea, you’ll likely want to explore the half-gallon and gallon varieties. Canning jars work for bathroom storage space as well. I use several of the antique ones with metal latches in our master bath for cotton balls, Q-tips and manicure supplies. If you’re organizing a rustic, outdoor event, consider using various sized canning jars as candle holders for table lighting, driveway luminaries or hanging tree lights. Just pop some tea lights inside and skip the stress of weighing down brown paper bags, cutting out special designs or a strong wind creating party panic if your light sources are blown astray. Did you know that narrow-mouth mason jars fit perfectly onto your blender base? Seriously, they do. This saves having to scrape whatever you’re making into a separate container and wash out the entire blender container between uses. Whether you’re whipping up peanut sauce by the quart or blending custom banana daiquiris, you need only worry about cleaning out the blade base. This trick also does a slamming job on homemade salad dressings. It gives you the emulsification you need with an easy cleanup afterward. Just screw on the right size jar top and store the fruits of your labor easily in the fridge until needed. When you need just the right hostess gift or house warming present to a new neighbor, a jar gift is a heartfelt, home-spun way to make a great impression. Spice blends, bread mixes and layered cookie ingredients are all popular choices that don’t require cooking in advance. Just print the instructions on a nice tag and tie them around the jar with a ribbon. Home-canned fudge sauce, homemade salsa or a delicious and unique pickle recipe you’re famous for make fantastic gifts as well. Whatever your gift-giving needs, canning jars get it done. Bonus? They can be used over and over again, making them a fantastic green gift giving idea. Choose a height suitable to your seating arrangement and get creative. Pint-sized arrangements of carnations are adorable for a summer baby or bridal shower. Beautiful fall arrangements are also simple to accomplish by placing a jar of flowers inside a squash or gourd. I think it’s tough to beat one of the taller antique jars filled with wildflowers for the ultimate in relaxed, al fresco dining. But that’s just my humble opinion. Whether you’re going with a fruited sun tea, frozen pina colada, or brunchy bloody Mary, canning jars keep it casual and charming. In fact, I’ve noticed several restaurants over the years that use these instead of actual glasses for their customers. So, bring on the lemonade, keg drafts and hard cider. Drinking jars are where it’s at. With more and more people trying to pack their lunches in a sustainable way these days, reusable containers are gaining popularity. For soups, dips, and smaller items, consider canning jars as an affordable alternative. Granted, they aren’t exactly suitable for young children, but for adults, teens, and the college crowd, they’ve got potential. They’ll work particularly well if you’ve got a padded or hard-case lunch container to transport them in. 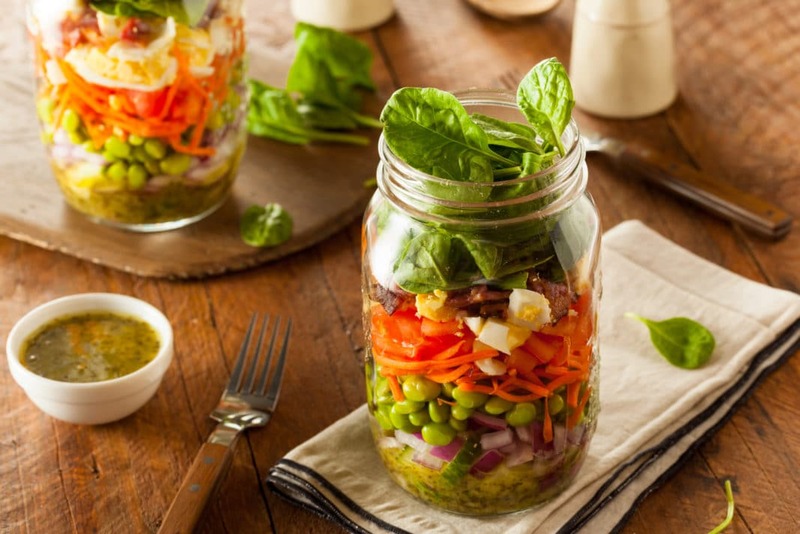 Use short, wide mouth pint jars for soups, pasta salads and puddings. Smaller, half-pint jars are great for things like Asian peanut sauce or salsa for veggie and corn chip dipping. As you can see, when it comes to making your home run on a budget, canning jars have lots to offer. They fit the bill for everything from unique gift and decorating ideas, to cheap organization options. So go to your local hardware or craft store and stock up! You never know when they might come in handy. How do you use canning jars in your home? Share some of your creative and fun ideas in the comments below! Myscha Theriault is a syndicated columnist with McClatchy-Tribune News Service, best-selling author and professional blogger whose work has appeared on such web sites as Forbes, MSN, the Los Angeles Times and AOL. Print interviews include Better Homes and Gardens, the New York Times, Women’s World and All You magazine. She is the founder of Trek Hound, a site for independent travelers, We Be Sharin', a home living web site, and The Lesson Machine, a site for teachers both Stateside and abroad.